Tijuana techno came to Minneapolis and the usually staid McGuire Theater became a nightclub, with dancers crowding the aisles and the front of the stage. 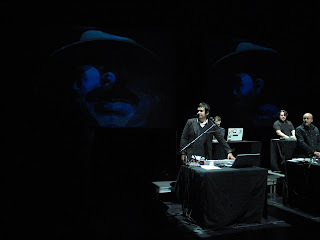 Presented as a related event to the Walker's exhibition Frida Kahlo, Nortec drew a young and diverse audience. Band members Robert Mendoza (a.k.a. Panoptica), Pepe Mogt (Fussible), Ramon Amezcua (Bostitch), Jorge Verdin (Clorofila), and Pedro Gabriel Beas (Hiperboreal) stood behind their laptops, playing sounds sampled from dusty audition and rehearsal tapes, indigenous and street Mexican music, and driving dance beats; on either side were a trumpeter and an accordion player who added real-time improvisations. Behind the band, two video screens flickered and glowed; the lights on the stage and in the theater pulsed on and off. It was two hours of party music, and I liked it a lot. I made a short film (like lots of other people) with my digital camera, and if I can ever figure out how to get it onto YouTube, I'll link to it here.